It's about five degrees fahrenheit outside right now. A cold blast of Canadian arctic air has invaded the northland and I'm huddled inside my warm house with a little time to work in the studio. I couldn't decide if I wanted to paint or draw tonight so I compromised and went with charcoal. For those that don't understand how charcoal can fall between paint and pencil your just a project away from a deeper understanding. 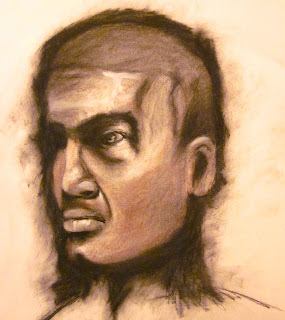 Whenever I work with charcoal I learn something about its properties or behaviors. For instance the painterly qualities can be both wonderful and disastrous depending on what you do with it. Being fascinated with portraiture I enjoy trying new things and experimenting with various media. This particular work was no different. I used a combination of charcoal and conte. I pushed values and worked in some highlights. My seven year old son Ethan tells me he likes this drawing, so it's a success.